Sowerby (1895-1968) is unquestionably America’s premier composer of church and organ music, and also one of the most performed symphonic composers in his time. A child prodigy and true American original, Sowerby saw his music premiered by the Chicago Symphony Orchestra at age 18, won the first ever American Prix de Rome for composition and beat legendary composer Aaron Copland for the 1946 Pulitzer Prize. Born in Grand Rapids, Michigan, Sowerby had a long association with Chicago– where he studied at the American Conservatory of Music and later taught as head of the composition department following duty in World War I and advanced study in Rome. He later was appointed to the prestigious post of organist and choirmaster at St. James Episcopal Cathedral in Chicago, for whom many of his greatest works for choir and organ were composed. Sowerby went on to become the Director of the College of Church Musicians at the Washington National Cathedral and was named the first American Fellow to the Royal College of Church Music. One of the greatest treasures of the Sowerby Papers (and of the Music Library) is the manuscript conductor’s score for Sowerby’s 1946 Pulitzer Prize winning The Canticle of the Sun. An exceptional composition for chorus and orchestra, the work sets a song text penned by St. Francis of Assisi as translated into English by Matthew Arnold. The Northwestern score, hand copied in ink, bears conductor’s markings from performance preparations. This makes the score an invaluable resource to study the composition and how it was interpreted in early performances. 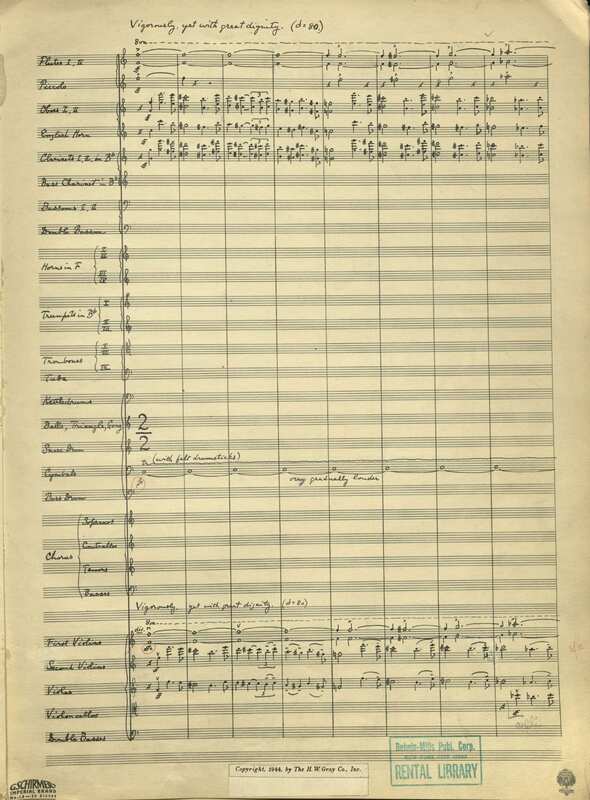 Furthermore, the Northwestern score is the only known copy of the full score, which enabled the Grant Park Orchestra to generate parts and perform the work for the first time in decades in June 2009. The Sowerby Papers, like many other distinct manuscript and archival collections at Northwestern Libraries, are open to researchers and students of all levels. This level of access is key to our mission to provide unique opportunities for insight, original research and scholarship to all members of the Northwestern, Chicago and global communities.